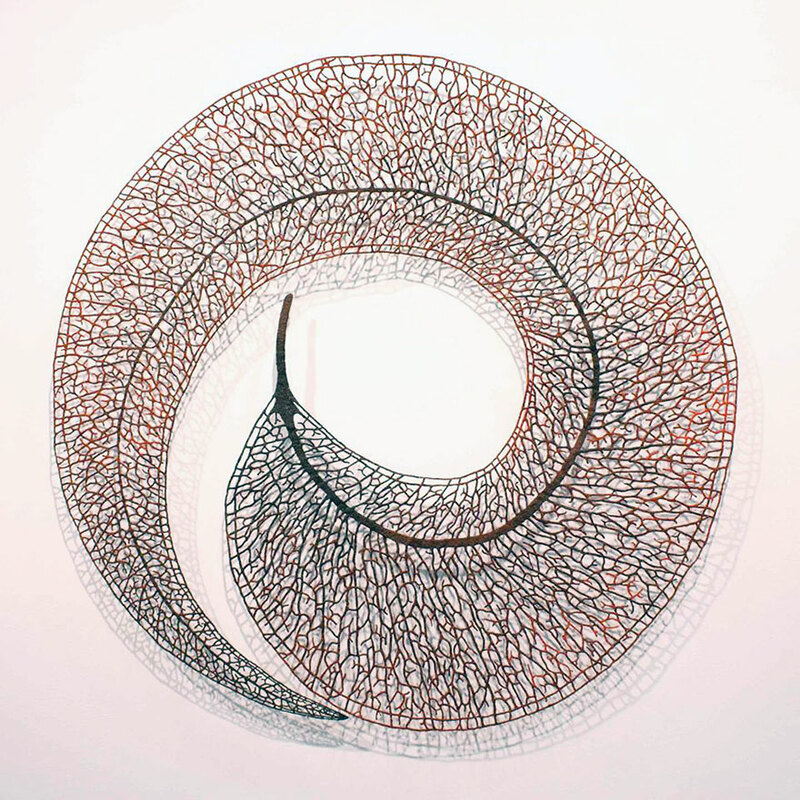 A friend of mine posted a link to Meredith Woolnough's embroidery the other day. 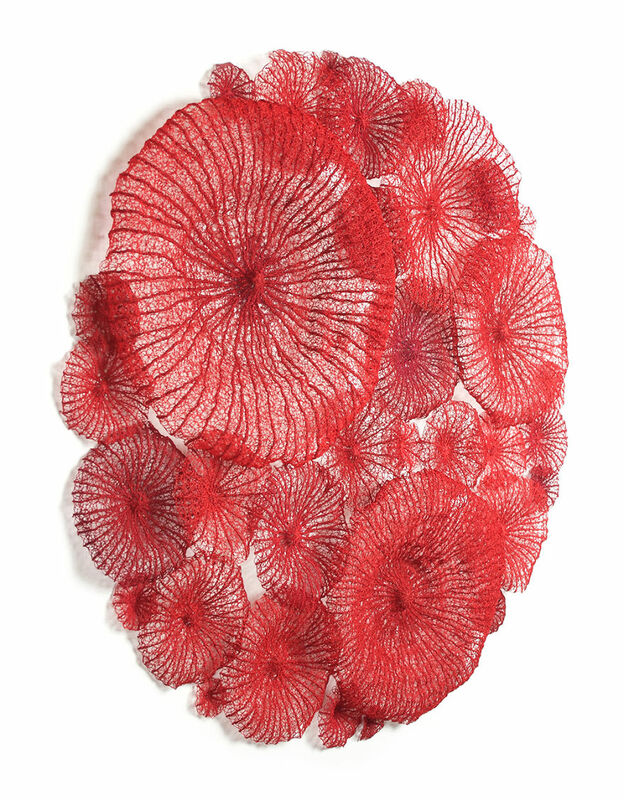 She does embroidery designs to mimic nature's fragility and beauty. It's gorgeous. It's always fun to see what creative things other artists are doing! I love the purple fabric I used in this flower. It's one of my favorites. It has all sorts of dots and circles in orange and pink on a purple background. I often look for batiks that have a few colors to tie together blocks and I know this fabric is going to get used a lot for just that purpose. I had fun with the greens in this block. with each layer I added I used darker threads and made the stitch size bigger. Don't you just love the deep dark purple I added here? I used most of the warm spectrum for the flower and I am quite happy with the results. I also really like the bottom green. It's a really fun batik design. Again you can see the size of the size of the stitching on the green growing. below. You can also see that I varied the size of the stitching on the flower a lot. The stitching on the purple batik with orange dots was really small. I did this on purpose because I wanted to minimize how much it could be seen. Another view of the greens from the back with the stitching on the top of the pot added. You can see in the middle of the pink oval how I start and stop when I know I'm going to be adding pieces on top. I do about 1/4 inch of small straight stitches to lock the threads in place. Here's the back of the pot complete. And here's the front! I love how I used two fabrics that have rings. I think it helps draw your eye from the pot to the flower. I bought a lot of the batik in the pot but have had a hard time using it because of the extreme change in scale between the small and large size oval rings. I think it works great in the pot. The pattern for this block will be available next week. I'd love to see what you're doing with my blocks. Join my Machine Applique Adventures Facebook Group and share! Have a great Saturday! It's supposed to be 55 and nice here in Minnesota. Great for the first hike of the spring. My cell phone is usually buried in my desk at school so it doesn't go off if anyone actually calls it during the day. However, yesterday afternoon it was in my coat pocket after recess and rang. The class looked at me accusingly of not turning it off. After school I checked my messages and there was one from Kentucky. I thought for sure it would be about he quilting book I'm writing that will be out in the fall, but no. It was even BETTER. My quilt, Harmony's Loop took FIRST PLACE in home machine quilted wall quilt at AQS Daytona Beach! I AM SO OVER THE MOON EXCITED! Time to quilt some more on the next show quilt! Time for Flower in a Pot #3! Here is the pattern drawing that will be coming soon. One of the things I'm playing with in my Flower in a Pot series is changing the width and length of my blanket stitching. I didn't make them very wide for the flower pot base because I wanted to let the fabric show. However, I used a much larger stitch size for the center pink below and for the outer orange points. The fabrics were fairly plain and I wondered how a larger stitch width would enhance them. I discovered that if I use a large stitch width (the distance the stitch comes into the fabric), I still need to keep a shorter stitch length (the distance along the edge of the fabric). If I use a really long length it can be problematic when I get to corners or points and have to take a really long stitch. You can also see that I stitched a straight line between the two orange points. I know another piece is going to cover these two pieces, so why bother starting and stopping? I did face a dilemma on this particular block. I had three overlapping orange points and I really didn't want to start and stop after having done the first set. Why? Because I was too excited to add the next piece! So, what to do? I decided to put on both remaining pieces. I started my blanket stitch and when I ran into the second orange piece I switched to straight stitch and sewed all the way to the bottom where I wanted the blanket stitch to start again (second picture below). I then complete the blanket stitching on the third orange piece. This was effective since all the points were stitched in the same color. If they'd been different colors, I wouldn't have been able to use this method. Below you can see that I've stitched a straight line along the edge of the piece. I'll stitch over this line with new blanket stitching. Here I have started blanket stitching the third orange piece. Here is flower from the back side. You can see that all the stitching except the really light green stem is done with a large stitch width so it comes really far into the fabric. I discovered that I really like this effect on more solid looking fabrics and around larger pieces. I am not sure I would do it on busy prints or small pieces. It can also be a challenge on points because the long stitch can go way over the tip of the point. You have to watch for this and angle your stitching accordingly. Here's the block with the next pieces added. You can see why I was so excited to add them! If you look at the block you can see there is a thin orange strip between the purple fabric and the larger pink piece. I laid this piece down first, but did not stitching on it. I decided that since it was so thin it made more sense to simply put it on as the bottom layer and stitch on the pink and purple fabrics instead. This made adding it much easier. Happy Stitching! If you're following the Flower in a Pot Quilt Along be sure to check out my Machine Applique Adventures Facebook Group! Links to previous patterns are in a page at the top of the blog. 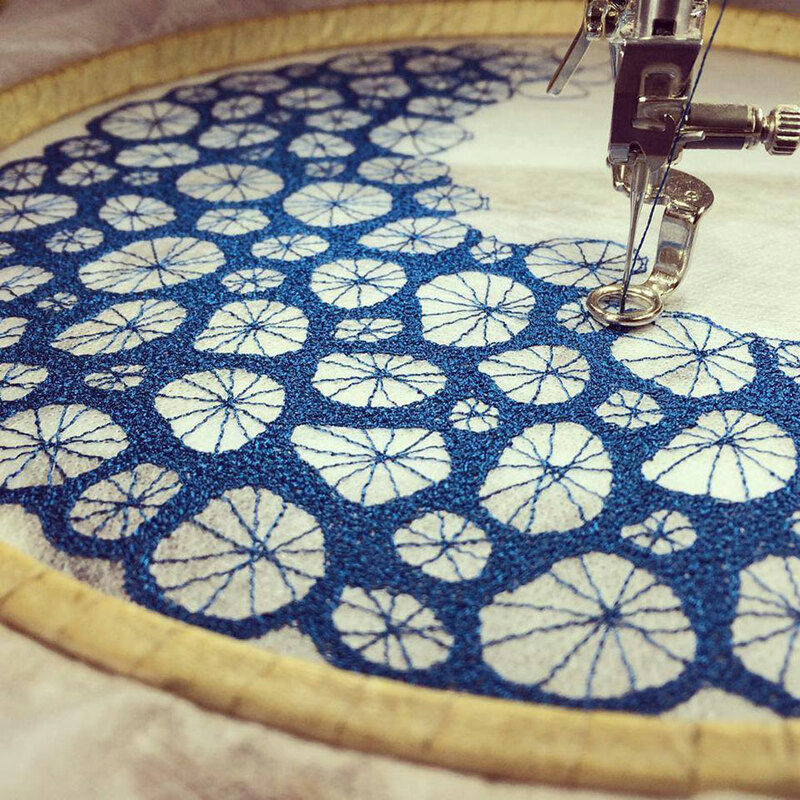 The process of making thread and fabric has always fascinated me. I ran across an article on the internet talking about Christopher Payne's Textiles Project. He is taking pictures of what is left of America's textile industry. They're fascinating and gorgeous. Here's the latest flower for our Flower in a Pot Quilt Along! Be sure to join Machine Applique Adventures on Facebook to share your progress and anything else your appliqueing! Here is Margaret's first block! It's so fun to see what other people do with my patterns. It's the weekend....time to go play with fabric! I have been having a lot of fun working on my Flower in a Pot Series. The pattern for Flower in a Pot #1 can be found on my post from Monday (click here). I love to free motion quilt. I particularly like feathers. I don't think I will ever get enough feathers. I decided to make the flower the "spine"of the feather and stitch off the outline that I quilted around it. I then outlined the feathers and did some stippling around the edge because I knew I wanted to add rick rack in the binding. Above and below are the pot from this block. I decided to wind my way in and out of the all the circles in order to quilt the pot. I knew that if I'd left the pot unquilted it would puff out a lot and I wanted to make sure that it was tacked down some. Here is a larger picture of how I did my feathers around the leaves and pot handles. It was fun to make a small single feather inside the handles. I knew that I needed to quilt something inside the flower since it is large. I could've done simple outline quilting, but instead I decided to fill the light blue area with 1/8 inch apart lines. You really can't see it from the front, but you can see it from the back in the picture below. Here is a picture of the back before I added the extra quilting in the pot and in the flower. You can see why it needed the extra quilting. Here is the quilt with the rick rack added. To see how I did this check out my post on putting rick rack in the binding. And here is the final quilt all bound and pretty! As I said before and will always say. I love feathers. These were not marked, but were done freehand with the space available. I learned to do this kind of feather from Diane Gaudynski. You leave space between the feathers so that you don't have to do a lot of backtracking. I know, it's not Monday. I'm too excited to wait another day! We're starting our Flower in a Pot Quilt Along! Part Two is especially important because you can see how I stop and start my blanket stitching. I can't wait to see all your lovely blocks! Please comment with any questions. And come share your work in our Facebook group Machine Applique Adventures. I am almost done writing directions for applique ladies! Look for that on Monday. Here's the rest of the process I used for appliqueing Flower in a Pot #2. The next layer I added is the dot fabric. I love the way it has dots in some places, but not in others and varies in color. I used this fabric as inspiration for picking out the fabrics for the flower. I usually do this when I'm picking fabric. I start with an inspiration fabric and pick other fabrics to go with it. Here is a view from the back of the block. You can see that I chose blue thread to stitch around the pot. I could've gone with purple thread, but the handles are stitched in blue and I don't like to use the exact same color thread on pieces that are next to each other. I'll use slight variations in color, but not the exact same color. Here is a picture of the back once I added the dots at the top of the vase. I faced a little bit of a conundrum when stitching the circles because I wasn't sure if I really wanted to stop and start on each of them. So I stitched the top half of all the circles and then stitched the bottom half of all the circles in a more continuous method. When I cut out the pieces for the circles at the top of the vase I purposely tried to get some variation in color (it's a batik fabric....my favorite!) to draw the eye back and forth. I was inspired by hobnail or milk glass from a friend's wedding a while ago. I have no idea why I remembered the bumps, but I did. And here's the finished block! I hope to have the pattern for Flower in a Pot #1 ready for Monday. Have a great weekend...quilt! If you haven't already join us on Facebook at Machine Applique Adventures! Wow! We have almost 100 people in the Machine Applique Adventures Facebook group! I'm really enjoying seeing all the projects people are working on or have completed. If you haven't checked us out yet, please join us soon! Here is the pattern for the Flower in a Pot #2. I plan to have this series of patterns available as soon as I have a chance to write up the directions! One thing I knew I wanted to play around with in this series of little quilts was using different sized blanket stitches in the same block. I used a really long width for these stitches so they came really far into the block. I like how it adds more texture. You have to be really careful when coming to the tip of one of these leaves to make sure the stitches do not stretch out far into the background fabric. I found I had to angle the stitches a little more than usual to accomplish this. Here is the top of the flower. It was nice that I was able to layer all of these pieces and then sew them in one layer. I used really small stitches for the purple and dark blue dots and a larger stitch size for the outer dark blue. Here are all the pieces I added in layer one. You can see there is stabilizer behind the block to help make sure the stitches lay nice and flat. I try to fuse on as many pieces on as I can in each layer. Then I stitch around them all and then fuse on the next layer. I use a light box to help position my pieces. Here is the back side of the block so far. You can see the different size stitches I used. Here is the block after I added two more layers. The stem and large purple piece were layer two and the stem was part of layer three. Here is a close look at the back of my block. You can see I start with small running straight stitches to hold my threads and then I switch to blanket stitch. I do this to lock the thread in place when I know I'm going to place a piece on top. When it's a piece that I know won't have others on top, I use a slightly different method I will talk about next time! Blog Post #100! And a Machine Applique Facebook Group! 4. I have become an Island Batik Ambassador! More on that another day! AND NOW....I am starting an applique Facebook group called Machine Applique Adventures! I am excited to see what other people are appliqueing. I've been looking for a group like this on Facebook and there are many out there for machine applique and embroidery using an embroidery system on a sewing machine, but there aren't any for people who simply do applique by machine. I'm hoping this will be a starting ground for people who applique to share what they've been up to. So...follow this link and join the group today! Now that I've completed the quilting on Flower in a Pot #1, I decided that it needed a little something fun for the binding. I thought about using a blue fabric to do the binding, but decided that would be too much. I though about using Susan Cleveland's Piping tool to make some piping to put in the binding. But honestly, I was feeling lazy so I didn't want to spend the time making the piping. So what to do? My friend Liz loves rick rack. She encourages us to buy some every chance she gets. So I thought about that and realized that rick rack would be really fun on this little quilt. I went down to Joann's and found that they had lots of colors of rick rack. The one that went best with this quilt was a lovely dark turquoise blue that matched the accents on the pot. Four other packages also came home with me. I'd only planned for two, but who can resist rainbow or gold rick rack? I started by marking a line where I wanted the edge of the quilt to be. I then aligned the edges of the rick rack to that line. You can see below that I pinned every other hump. (what do you call the up and downs in rick rack?) I then stitched about an eighth of an inch inside my marked line to hold the rick rack on. This is not the final stitching line. This stitching will end up inside the binding once I sew it on. It's the basting stitching to hold the rick rack on. I did not use basting sized stitches however because I didn't want the rick rack to fall off. I did the same thing on the opposite side of the quilt. When I went to sew the remaining pieces of rick rack on I was very careful about how to align the corners. I wanted to make sure that they looked nice. Here's what it looked like once I was finished sewing all four pieces of rick rack on. And here is the final small quilt once I'd trimmed and sewn the binding on. I couldn't be happier with the way it turned out. I'm glad I left a little room around the edge of the feathers so that the rick rack didn't cover the feathers.